Every day, all around the world, infants, children and adults are getting vaccinated. If we were to calculate the exact number of vaccines administered in just one given day, I’m certain the number would be staggering. And the most amazing thing about this enormous number would be that in the overwhelming majority of instances, the vaccines are administered and nothing happens. Nothing bad that is. However, something does happen. Vaccines help our bodies to build important immunity to protect us from some very dangerous and even deadly diseases. Although it may be happening without much fanfare, it deserves to be celebrated because vaccination has been credited with saving countless lives and sparing people from enormous amounts of pain and suffering. Unfortunately, the problem is that our society seems to have a fascination with pain. And when it comes to print and television news, suffering sells! By focusing on the miniscule chances of an adverse event that can be caused by a vaccine, we tend to create a false sense of risk and reinforce irrational fears. While the overwhelming majority of people accept the scientific evidence that vaccines are safe, there will always be a few vocal critics that will argue that vaccines cause everything from autism to autoimmune conditions to infertility and everything in between. But here’s my story. I was vaccinated. Many times. And all I’ve ever gotten was a sore arm. Now, that’s not to say that there aren’t risks to vaccines, as there are with all medications. We know that, rarely, people experience serious reactions after vaccination. We know this to be true because vaccines are some of the most rigorously tested pharmaceutical products on the market today. And they should be. They are administered to nearly every person in the U.S. And we are fortunate to have lots of regulatory bodies to constantly monitor vaccine safety, even long after the extensive pre-licensure testing. So while we can claim that vaccines are extremely safe, we can also identify the likelihood of serious or adverse event for each vaccine based on verifiable scientific research. With that being said, it’s important that we keep perspective on the risks versus the benefits when we discuss vaccines. I know hundreds, maybe even thousands, of people who have stories like mine. They have been vaccinated and have never experienced any adverse reactions. But I doubt you will ever hear our stories. Unfortunately, the media often does public health a great disservice when they go after the shock factor. It’s much more compelling to interview someone who claims extreme injury from a vaccine than it would be to talk to any of the millions of people who received that same vaccine without incident. And it’s even more fascinating to hear of devastating health problems someone alleges are the result of a vaccine that is intended to protect us, than it would be to talk to a victim of the disease who has suffered even greater pain. Although reporters may believe they are offering a “balanced” story, the emotional fear created by medically unverified stories of adverse events are not easily “balanced” by a white-coat doctor referring to the statistic of lives spared and safety data on a chart. The information a medical person provides should weigh more than the non-scientific statements made by a person alleging vaccine injury or illness, but the unfortunate reality is that people often weigh comments equally, regardless of whether they are coming from someone with a medical or scientific background or not. Take the HPV vaccine as an example. It has been repeatedly suggested that the low uptake of this vaccine can be attributed in part to parental concerns about safety and the question of necessity. Not only are parents finding it difficult to accept that their child may need protection for a sexually transmitted virus, but they are constantly bombarded with misleading propaganda and faulty information. Many of these myths have been addressed in a previous Shot of Prevention post that you can read here, but this kind of scientific evidence is hard pressed to compete with the barrage of media messages that continue to exasperate parental concerns. 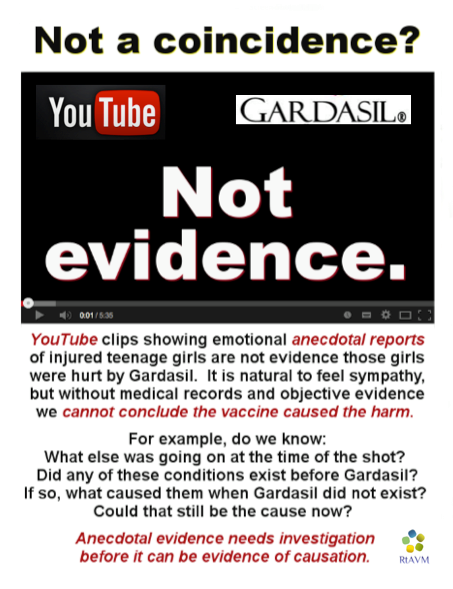 For instance, within the next week or two there are two major talk shows that will be covering claims of injury from the HPV vaccine. “The Doctors” will be filming a segment this week with two Wisconsin sisters who claim the HPV vaccine caused their primary ovarian insufficiency (POI). In the interest of creating a “balanced” segment, the producers intend to secure a physician who can speak to the safety and benefits of HPV vaccination. Having a physician there to talk about HPV vaccine is essential; however, to balance the emotional plea of the sisters it would be more impactful if they were to also invite someone who has suffered with a life-threatening case of HPV. Or, the family of young Heather Burcham who died as a result of an HPV related cancer. Additionally, Katie Couric’s talk show “Katie” has filmed various segments for an upcoming show focused on a specific HPV vaccine named GARDASIL . The show, which is expected to air within the week, will feature two stories of people claiming adverse events after vaccination with the HPV vaccine. Dr. Mallika Marshall, a Boston pediatrician, as well as a mother and daughter who have had a positive experience with Gardasil are also expected to be on the show. These are just two instances of how the HPV vaccine is being highlighted on television in the next few weeks. It will be interesting to tune in to see whether the emotion will overshadow the data. Regardless of what we will see next week, we can be assured that the media will continue to have countless other opportunities in which they can help provide a better perspective on the risk versus. the benefit of the HPV vaccine. Which is why we need to do our part – as doctors, nurses, public health professionals, and concerned parents – to help people understand the science and safety data that supports vaccines. If the media won’t give us air time, than we need to demand it ourselves. Through the power of social media and our own extensive social networks, we must remind others that people get vaccinated every day and nothing bad happens. Here are a few vaccine advocacy campaigns that you can participate in to show your support of #TeamVaccine. Share positive images of the people you know and love who are vaccinated. 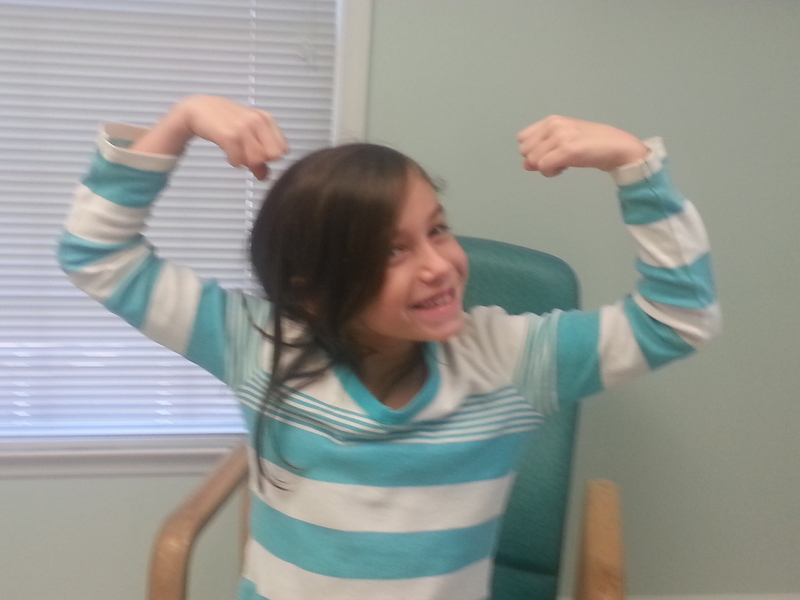 Take a picture, as suggested in this PKIDS blog post, and share it on social media with the hashtag #I’mImmunized! or, #We’reImmunized! Support the California Immunization Coalition’s Thank You For Vaccines campaign, which highlights the benefits of flu vaccination. If you spot one of their billboard ads, let them know by participating in their billboard sighting contest. If you don’t live in California you can still show your support through social media by posting one of their banners onto your website or Facebook page. Highlight your support of vaccines by using the hashtag #TeamVaccine and other clever hashtags that you create. Here are some examples that I’ve received from friends. Feel free to share these or create a few of your own. You can also send your tweets and ideas to info@vaccinateyourfamily.org. I remember getting one of my vaccine boosters back in the day (I was, perhaps 5) in the thigh & it hurt like heck and was sore for a few hours. But that was it – nothing else. My kids have been vaccinated (fully) and haven’t suffered even a fever….. This sounds like it should be a T-shirt. I went to be vaccinated, and all I got was this lousy sore arm (and no disease). I have several areas on the skin over my left deltoid muscle that have lost a little bit of pigment (~2 mm), from the three smallpox vaccines I received. Smallpox was eradicated from the face of the earth, because of the smallpox eradication campaign. The “worst” vaccines for me were the hepatitis B intramuscular vaccines…dull achy feeling for about 10 days. A few weeks ago, at the start of the flu season, I brought my oldest in for his physical and was able to schedule his flu shot at the same time. He received the Hepatitis A vaccine and the Flu vaccine in different arms, turns to me and says, “That was it? There were only 2!” I told him we were done, and he hopped off the table, and we went to “Toys R US’ to check out the newest Mario video games. The only time that day he showed signs of being upset was when he found out they were out of a game he wanted, but quickly perked up when he saw they had a Lord of the Rings game available. That is really fascinating, and we should probably highlight that, because it’s part of the explanation of the unfortunate bad rep of that vaccine. My whole family including my own 2 kids are fully vaccinated. Nothing bad happened. All the kids in my school were also fully vaccinated. Nothing bad happened. I don’t know of anyone who has ever has a serious adverse reaction to a vaccine.